Why are so many lovely ideas absolutely destroyed by greed? Take Rethink's extremely clever clothing hangers. 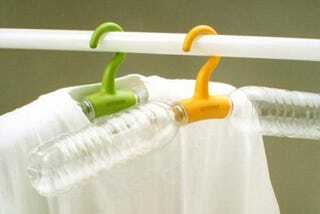 They save manufacturing plastic by allowing you to beef up their structure by screwing in always-plentiful used water bottles—plus, these small hangers are portable to boot. Simple, right? Kinda awkward in practice, sure, but A for eco-Utopian effort. Each Rethink hanger costs $7.99.